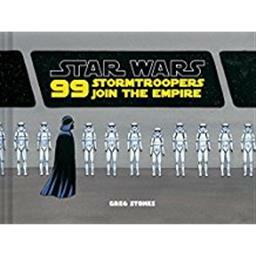 Ninety-nine Stormtroopers join the Empire and then their troubles begin. One takes a lunch break in the carbon freezing chamber. Two underestimate a princess. One picks the wrong time to ask for a promotion. Another fails to show Jabba the proper respect. And one interrupts Lord Vader's private time failing him for the last time. A lifelong Star Wars fan Greg Stones brings a playful wit and sympathy for the plight of the troops as they meet their amusing ends filling each colorfully painted scenario with funStar Wars details and appearances by Han Luke Chewie K-2SO and many other characters. As the trooper count ticks down how will the last one fare as he receives a very special assignment (on the Death Star)?